Last week I talked to a veteran. The call was exciting and rewarding, and I was again reminded why I give a year of premium to veterans at no cost. I do this as a thank you. I had goosebumps and found it hard to respond. 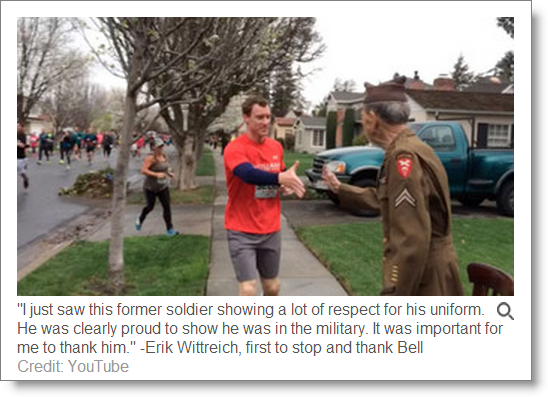 After our call I saw this neat story in the news about the race in San Jose where one runner (Erik Wittreich, a former Green Beret) went out of his way during the race to shake the hand of a veteran… a 95 year old veteran, who was cheering on the racers. Bell was a former Army corporal who trained paratroopers all over the world for the Office of Strategic Services (OSS) that preceded the CIA. I think it’s kind of sad that Bell didn’t feel like anyone recognized him. Maybe he humbly didn’t recognize the Nov 11, July 4, etc. holidays that recognized servicemen and servicewomen. I’m glad that he had that once-in-a-lifetime experience… what a choice opportunity. Now let me tell you something special about all of this recognition stuff. I have been around military, in one way or another, since I was eleven. I know people that serve, their spouses, their kids, and even their grandkids. There is something I have learned, over the years, and recently as I talk to veterans who use JibberJobber. Veterans, in general, do not feel entitled to handouts, help, etc. They do not feel like we (people, stores, companies, restaurants, the government) needs to give them everything. This is NOT about entitlement. They do, however, want a chance to show who they are, and to be respected. Not respected because they are veterans necessarily, but respected as human beings. How can we, you and me, give them that chance? When you see special deals and offers for veterans, please do not think that it is an entitlement thing. What I’ve found is that they are sincerely gracious, but never expecting or demanding. We can do our veterans a better service by giving them humane respect, and a chance.